the dividend payout ratio based on as reported earnings is 47.6%. This remains down from the 60.7% payout ratio in the fourth quarter of 2015 which captured the negative impact of the energy weakness and the headwind from the strong U.S. Dollar. for the calendar year of 2017, dividends plus buybacks equal $939.17 billion versus $933.60 billion for 2016. Howard Silverblatt, Senior Index Analyst for S&P Dow Jones Indices, commented in the press release that the buybacks and dividend combination could exceed the $1 trillion level this year. 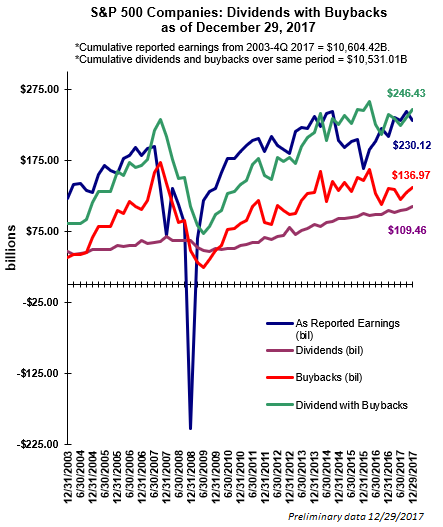 Driving the potential increase in buybacks and dividends this year is the reduced corporate tax rate along with the repatriation of cash trapped overseas. Howard Silverblatt also noted, "Preliminary cash reserves increased from Q3 2017, setting another record. S&P 500 Industrial (Old), which consists of the S&P 500 less Financials, Transportations, Real Estate and Utilities, available cash and equivalent stood at $1.636 trillion, slightly above the $1.630 trillion level for Q3 2017; available cash stood at $1.478 trillion for Q4 2016.
the financial and technology sectors have dominated the buyback volume as seen below. As noted earlier, S&P's press release mentions the benefits of lower corporate taxes and repatriation may serve as a tailwind for 2018. "Dividends, which are on track to set a seventh consecutive record annual payment for 2018, may return to double-digit gains last seen in 2015; 2016 posted a 5.4% gain and 2017 had a 7.0% gain." "S&P 500 issues have increased the size of their dividends hikes this year an average of 14.04%, versus 11.36% for 2017 and 10.51% for 2016. No issues have lowered their rate and there are 128 increases so far for 2018." "within the S&P 500, the average dividend increase during Q1 2018 was 13.9%, up from 10.4% during Q4 2017 and 10.2% during Q1 2017. The median increase was 10.3%, up from 8.2% during Q4 2017 and 7.9% during Q1 2017. Supporting the depth of increases are fewer dividend cuts and a resurgence of payments from Energy issues." Lower corporate taxes and repatriation may be already favoring investors.